Col. John George was born ca 1603 in England. As a young man he and his wife Jane came to Virginia and lived in Charles City County. After a few years they moved to Isle of Wight County. After Jane's death, John married Ann. John George died in 1679 leaving one son (Isaac) and two daughters (Sarah and Rebecca). John's descendants soon moved to other parts of Virginia and eventually to other states. 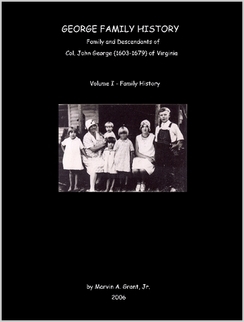 The Col. John George family is probably the second largest George family in Virginia, with Nicholas George's family being the largest (of Lancaster County). Recent DNA testing has proven that Nicholas and John were not brothers as once believed. Volume One contains a fully documented and fully indexed family history following each branch of the family as far as possible. Volume Two contains transcripts and scans of original documents such as deeds, letters, bible records, etc. It is also fully indexed. If ordering online be sure to order both volumes as they are two separate items that must be added to your shopping cart. (The price listed above in red is for both volumes.) Of course you don't have to purchase both volumes, that is up to you. Chapter 2 - Col. John George (1603) and wife Jane Cole and wife Ann of Isle of Wight Co., VA (17 pages). Chapter 3 - Isaac George (1636) and Hester Fawdon of Isle of Wight Co., VA (11 pages). Chapter 4 - Robert George (1666) and Sarah of Middlesex Co., VA (82 pages). Chapter 5 - John George (1704) and Mary Jordan and Ursula Dudley of Caroline Co., VA (126 pages). Chapter 6 - James George (c1734) and Elizabeth Noden of Pittsylvania Co., VA (59 pages). Chapter 7 - James Jordan George (1761) and Elizabeth Pemberton and Nancy Dugger of TN (73 pages). Chapter 8 - Charles Noden George (1791) and Celia Smith of TN and Graham Co., NC (74 pages). Chapter 9 - Lafayette George (1830) and Rachel B. Hensley of TN and Graham Co., NC (23 pages). Chapter 10 - Thomas Jefferson George (1862) and Elvira Carpenter of Graham Co., NC (50 pages). Chapter 11 - Other George Families in the Area. In this chapter I document quite a few other George families that lived in close proximity to my own Georges, but aren't related as far as can be proven (49 pages). Chapter 12 - Related Family Lines. In this chapter I document several families that are closely related to my George ancestors, including: Cole, Fawdon, Jordan, Noden, Dudley, Pemberton, Smith (of Carter Co., TN), Dugger, Hensley and Wright (71 pages). Bibliography, Glossary, etc. Full Index. Appendix A - Explanation of Records Used. I explain census records, deeds, and other types of evidence used to compile the family history. Appendix B - Primary Source Documentation. Land records, Wills, Estates, Pension Files, tax records, etc. Appendix C - Correspondence. Numerous personal letters from the 1700's and 1800's. Appendix D - Family Records and Miscellaneous Source Documentation. Bibles, journals, earlier family histories, etc. Also a commentary on the George Surname DNA Project. 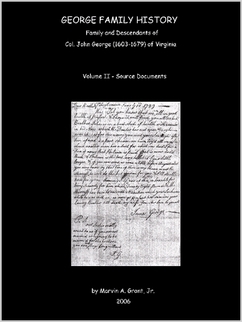 Appendix E - George Papers in the Library of Virginia. Explanation and Inventory of those records. Edition: Vol. I: Second (12 Nov 2006); Vol II: First (28 Aug 2006). Pages: Vol. I: 751; Vol II: 348. You may order from the publisher and pay via Credit Card, Debit Card or PayPal. They do not accept cash, check or money orders. Click below to order online or to preview the book. Unfortunately the books can't be purchased as one combined item, so if you want both, you'll have to put them into your cart separately. If you wish to pay by check or money order you must order it from me via snail-mail. Send the money to me at: Marty Grant, 3291 Alton Phillips Road, Kinston, NC 28504. The price for snail-mail orders includes shipping and handling. Once your check has cleared I will order the book(s) for you and have it shipped to your address. Volume I by itself: $49.00, Volume II by itself: $38.00, both volumes: $87.00.